At this time the cull of former DR branches was in full swing and it was still quite hard to keep up. Having been in Germany two weeks before I was able to reduce the ‘per diem’ cost a little by using the same EuroDomino – but spent the change in Magdeburg! Lufthansa were 10 minutes late leaving but on time, give or take, at Düsseldorf. Excellent nosh, and two G&Ts available if required. I stuck to coffee! Canadair Regional Jet is very small [known to me now as the Flying Coke Can!] but very smooth and quiet with rear engines, and me on row 2. Boisterous landing in a strong wind but no cause for concern. Just missed the 2133 to Hbf, so had to settle for 2203 – fare DM3.20, a reasonable £1.20 or so. The Ibis Hauptbahnhof is exactly what its name suggests – within the station buildings and therefore 100% convenient. Having phoned home, I was asleep within 20 minutes of leaving the train. Missed breakfast again for the 0627 to Hannover (IC626 ‘Dresdner Zwinger’) but Düsseldorf Hbf was more or less in full swing and provided ham rolls and a coffee in lieu of breakfast. The reason for a long stop (9 minutes) at Duisburg wasn’t very apparent although another IC did appear several platforms away- possibly a connection from Amsterdam? A few minutes were lost near Hamm, presumably engineering/single line, but partly recovered by Hannover. At Hannover (wondrous Italianate station building, restored after bombing according to photos), minor disaster struck with 0935 Goslar flagged as 15 late. It was then removed from the indicator in favour of 0949 ICE to Frankfurt, flagged as 10 late. I enquired of Platform Man if the Goslar train was still on the same platform – he said it was the next train. Fortunately I ignored this advice as the next train was indeed the 0949 ICE to Frankfurt. 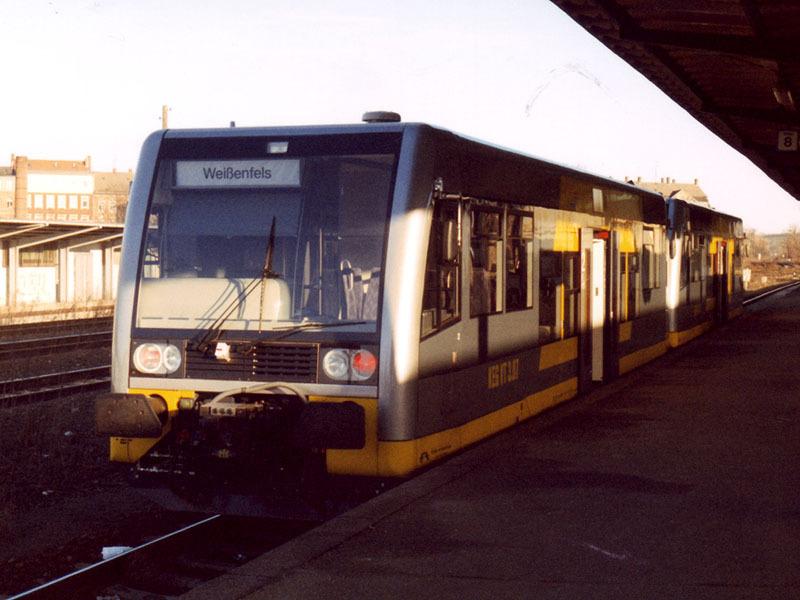 The Goslar train eventually appeared with a 218 and mixed ex-DB and ex-DR main line stock – I chose the latter to avoid being crippled – and left 27 late for a 13 minute connection at Goslar. It arrived 25 late at Goslar; I trotted hopefully off to P5 in case they’d held the connection, but ‘twas not to be. Returning to P1 I found near riot conditions with a large crowd of normals seemingly quite unable to grasp the situation. 1127 Vienenburg looked like a good shot and the beleaguered Frau Schortke confirmed this. She seemed relieved to deal with a polite foreigner familiar with the ‘missed connection’ concept! 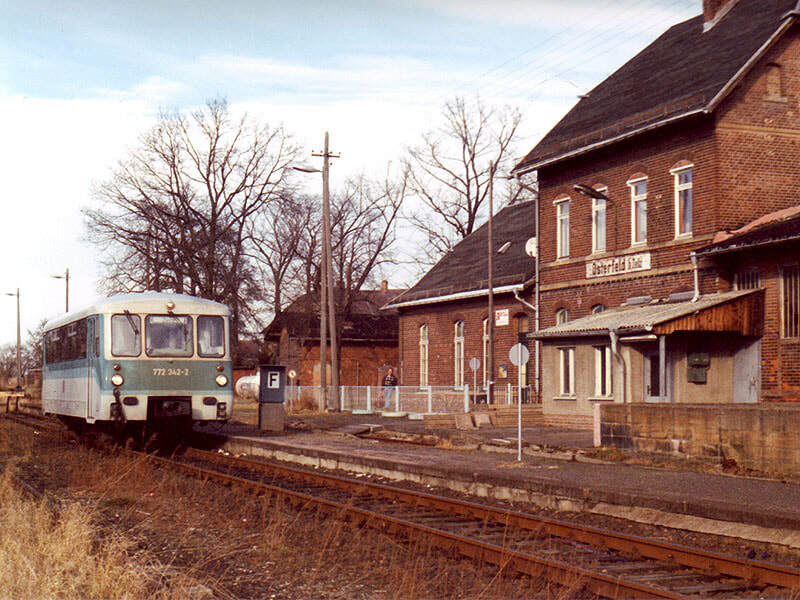 The DMU to Vienenburg went via Bad Harzburg so the direct line from Oker to Vienenburg remains to be done. Another unit was waiting at Vienenburg to go on to Halberstadt. While en route I got the map out to see where the reopened line went, and noticed how close Wernigerode was to Elbingerode. Since I didn’t need the track from Wernigerode to Halberstadt anyway it seemed worth investigating taxi or bus transfer to Elbingerode to pick up the original schedule, so I baled out at Wernigerode where both proved to be available. 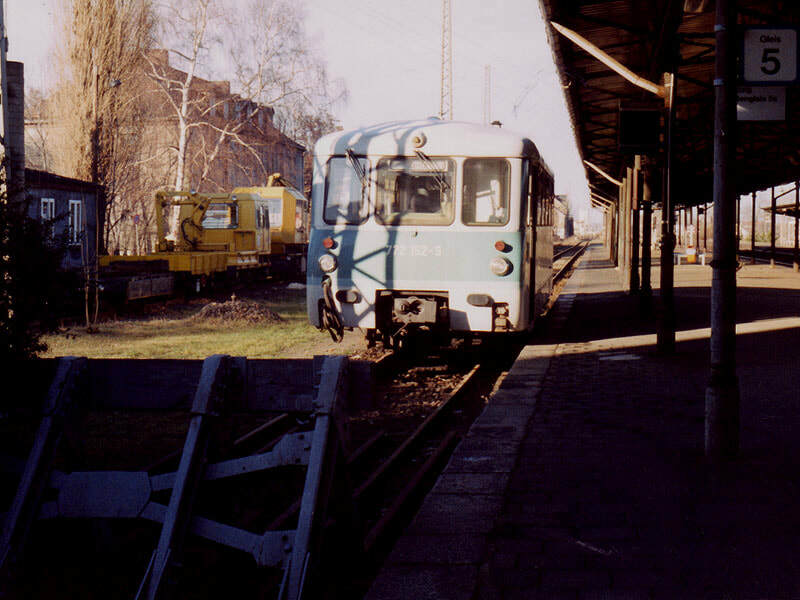 The line into the Harz system’s exchange sidings is shiny and there was one loaded (with old diesel engines) wagon, suggesting that there may still be some residual freight. 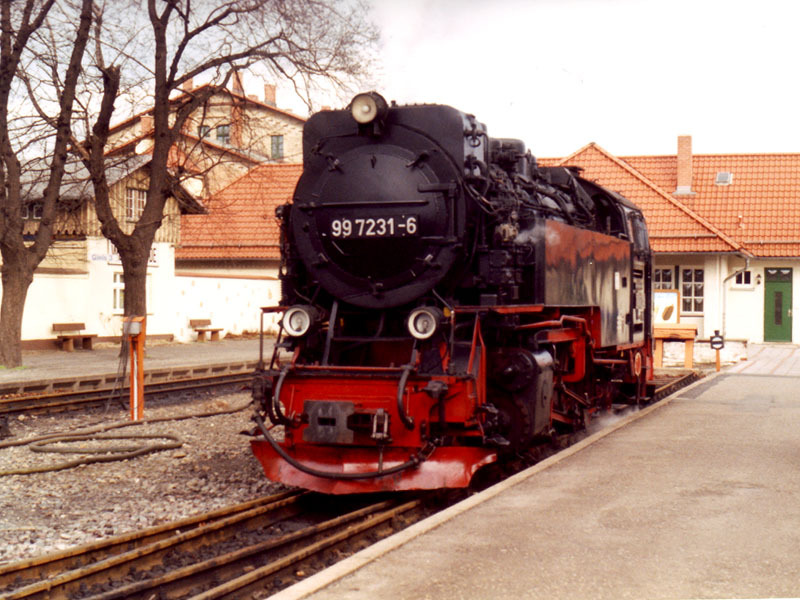 One of the 2-10-2Ts obligingly arrived while I was waiting at Wernigerode and provided a couple of mediocre shots. Three more and a diesel were on shed. I didn’t need a taxi, as for a princely DM3.50 the bus deposited me at Elbingerode at 1355, in good time to walk up to the station (via Karl Marx Strasse and Friedrich Engels Strasse – no revisionism in Elbingerode!) for the 1420 to Königshütte. A 171 was sitting in the station but didn’t seem to be going anywhere. 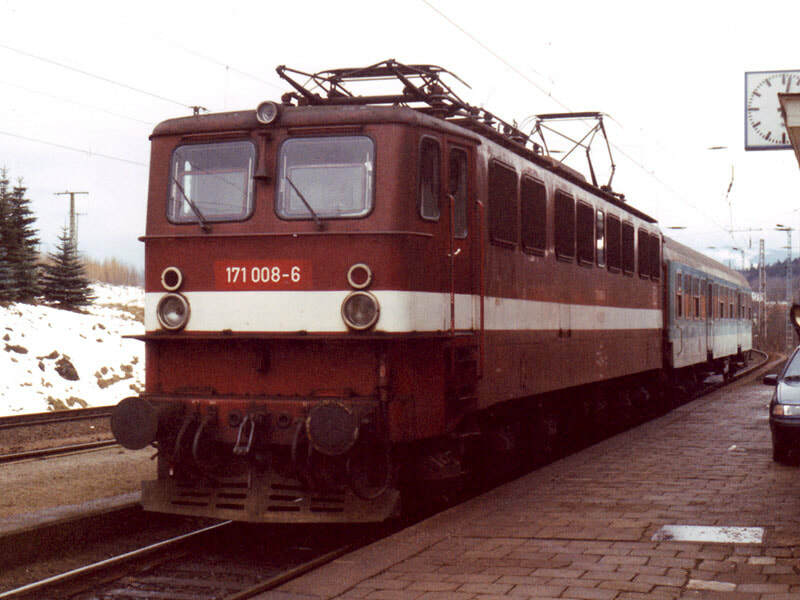 A Cargo liveried 171 with one coach duly appeared – a family of normals aboard and several enthusiasts. To my surprise a freight then appeared – four bogie hoppers with a 171 at each end, the rear one (171 001) smartly turned out in dark green. The reason for the whole setup became clear after a few minutes, with a quarry situated on a fearsome gradient just west of Elbingerode. The gradient becomes even more fearsome on the way down to Königshütte, to the point that it’s quite surprising that it’s adhesion worked (and less surprising that the fairly small 171s are Co-Cos). The trip back on the Rübelandbahn is amazing. Fierce gradients all the way, extensive freight from several quarries and some timber, and an unexpected reversal on the outskirts of Blankenburg which seems to be there only because the gradient would be impossible if it were not. The working at Blankenburg is incomprehensible and the 1620 was 12 late. At the time of writing I’m still hoping for the connection at Halberstadt… It was indeed held, leaving a minute or two late, and 232 hauled into the bargain. Normality resumed with a punctual arrival at Halle and an equally punctual arrival and departure (at 1840) of the IR from Hamburg to Cottbus. Safely in Leipzig at 1908 a room at the Ibis was procured (price had mysteriously gone up DM10 since 26.12.98 and the ‘Winter Special' for Dec and Jan had disappeared) followed by supper and an early night. Breakfast, for once, before 0829 all stations to Grosskorbetha. What is the metre gauge, double track electrified line you cross just before reaching the Halle-Weissenfels line? It looks like tram line but Leipzig trams are standard gauge and it’s a long way from Leipzig or Halle. [In fact it is tram line, it is metre gauge and it’s part of the Halle-Merseburg tram system]. At G/k I went to the yellow sheet as usual and the conductor of the Leipzig train shouted to me. I guessed he was asking where I was going so replied ‘Deuben’. He gestured me back on to his train and became so animated I thought he was going to drag me back on but eventually agreed ‘Bahnsteig 2’! All this while the Deuben train (772+972) was actually standing at P2! 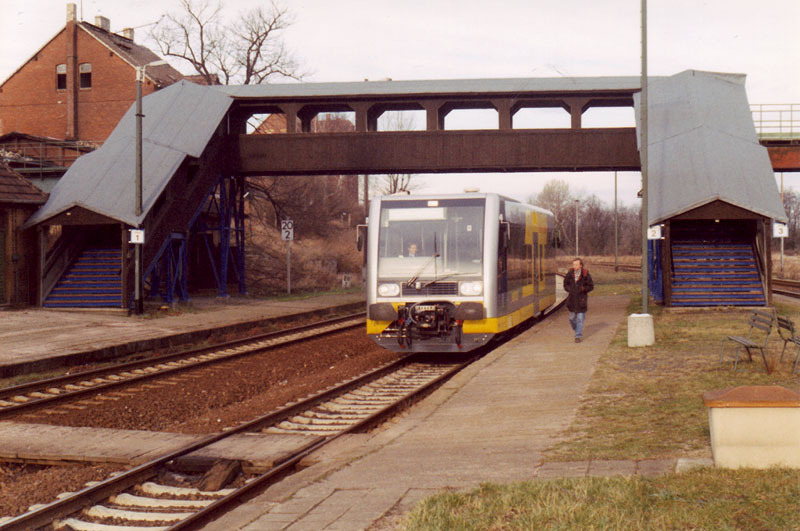 The 50 minute connection at Deuben is sufficient to discourage any through traffic to Zeitz, and it’s noticeable that the eastern part of the line has lighter track and no new bridges. On arrival at Zeitz the sheet indicated that Naumburg trains run on Sundays so substantial replanning took place, almost causing me to forget that I was there to do Osterfeld. [Good job I didn’t forget in fact – it’s closed since] Reason prevailed in the end and I set off on the 1111 to Osterfeld, 772 propelled, accompanied by one skinhead and one other gricer. Off to Altenburg, having decided to stick more or less to plan, on the 1311 – another 772 with another conductor convinced I didn’t want to go. It’s not the most interesting of lines though large scale freight branches diverge to and converge from the north at Tröglitz and Meuselwitz respectively. The map shows another of the mysterious quarry/mine symbols in the region. [Brown coal again, in fact]. 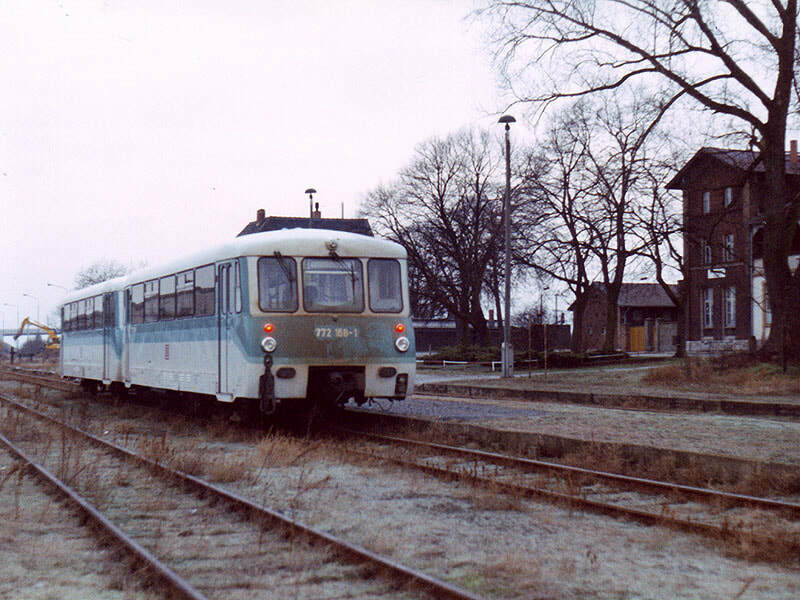 The railbus used the bay at Altenburg though seemingly using a freight loop off the main line to get there. Two normals joined and left intermediately and another joined near the end. There was a similar volume of traffic coming back so this was probably a worthwhile grice. Back at Zeitz a second kart was attached to the 1518 to Weissenfels leading me to hope that it will go to Naumburg, previously a M-F service. The timetable certainly suggests so, and the kart has ‘Naumburg’ on the front. This seems the better of the two to do in the available daylight as it has a slower and sparser service. It proved to be a very satisfactory line which steadily became more attractive as it got nearer to Naumburg. The sudden appearance of a McDonalds, a Jet station and a supermarket as you go over the top of a hill are a bit of a surprise, but this turned out to be the outskirts of Naumburg, where the line starts to drop down to the Saale. Punctual arrival at Naumburg provided a comfortable 5 minute connection into the 1619 Halle and fading light plus the fact that I needed Merseburg-Halle were enough to keep me on the train past Weissenfels. Light was almost gone at Halle by which time the Weissenfels-Zeitz train would only just have been leaving , so a good decision as it turned out. After a mile or more going northwards past a huge chemical works north of Merseburg you come to a station – Leuna Werke Süd. This is a seriously large works and goes on past L.W. Nord, another mile at least. Halle looks like a place to avoid staying – a long way from station to town centre and no obvious hotel ads. [This was before the days of using the wondrous HRS, and indeed there weren’t as many hotels in the former DDR then as there are now.] Much the same in Magdeburg (arr 1853)! Eventually the Upstalsboom Hotel Ratswaage obliged for a trifling DM138, and that at Sunday rate, weekdays another 100. Very nice, as you might expect, with free minibar containing exceptionally revolting pils. Well, you have to try. Desperate attempts to replan departure to allow breakfast failed. Off to Magdeburg Hbf at 0555 to sample McD’s ham and egg breakfast. Looked nice, comparatively healthy by their standards, and was absolutely disgusting. The coffee was OK though, and welcome on a cold morning. A grown-up would have checked his train time before having breakfast. No problem though; it had been retimed but fortunately 1 minute later. The train was formed of the ‘curved window’ double deck stock in which at least short people like me can sit comfortably upstairs. At Güsen there appears at first to be no branch. In fact the branch platforms are separate, south east of the main lines and two 772s were waiting, presumably one each for Zeisar and Jerichow. At Genthin the Jerichow platform is a bay, more or less part of the main station but with an old style low height platform. The four ‘passengers’ on the 772/972 had me fooled – all rail staff. Daylight was highly technical at 0721 though appearing, just, so it’s fortunate that the first mile or so is a large loop through the suburbs of Genthin with lots of flats, factories and lights. The line then runs parallel to the main road all the way to Jerichow with only minor diversions. It’s all flat, and mostly forest (Genthin Wald) so less than interesting given that it was foggy as well. Jerichow is larger than the map indicated but the station is still pretty desolate. It still has freight facilities but no sign of traffic. The line on to Schönhausen continues alongside the road, equally flat and boring. Schönhausen has a separate branch ‘station’ across the drive from the main one which itself is on a slightly separate alignment from the new high speed line. 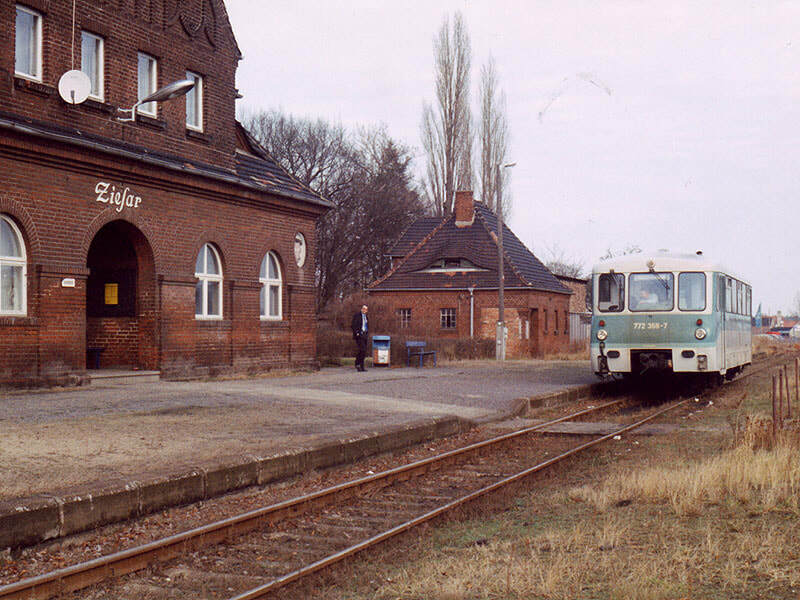 The same four rail staff travelled to Schönhausen and back. Another gricer joined at Jerichow and one normal intermediately. Back from Schönhausen it was just 2 gricers plus 4 staff and 2 train crew. No wonder it’s closing. The same four reappeared at Jerichow to go to Güsen, but with a different conductor (third today, so far). The Güsen line starts off in the same flat/trees style but becomes a bit more interesting nearer Güsen. A scrapyard and concrete sleeper factory provide freight. One normal joined at Pavey, providing the only revenue. The other gricer reappeared at Güsen, presumably having come by car from Jerichow. Back at Güsen the job was done, the Fab Four dispersed and I made the long trudge to the relocated Magdeburg platform to wait for the 1307 which was again wide bodied double deck stock. On arrival at Magdeburg (early) there was time to procure some lunch and go for a beer (Hasseroder, very pleasant by pils standards) in the bar, where I was engaged in conversation by a Magdeburger very familiar with Castletown, Peel, Douglas et al. Can’t be many of him. 772 358 stands at Ziesar, once a junction but by 18.1.99 a terminus, and now closed. The trek west started on the 1400 IR to Helmstedt, which proved on arrival to have a very handsome stone station building, several hotels, a very attractive market square and no visible stationery shops. [My notebook was running out and I couldn’t find a new one anywhere]. Moral: if you want to stay in Magdeburg, stay in Helmstedt. It’s only half an hour away. Changing to the 216 and ex-DR stock for the loop via Jerxheim, the mysterious map symbols (see 17.1.99) were explained. They are indeed opencast mines and there are two huge ones on the south side of this line, one again having its own rail system with ‘crocodile’ electrics. Once past these there is little of note other than some more fine stone stations. Braunschweig provided a surprise when I checked the yellow sheet – no trains to Fallersleben/Wolfsburg. The Fallersleben branch appears to have shut. As the top of KBS115 had been bustituted I decided to do 115 as far as Gifhorn which was as far as I could get in daylight. 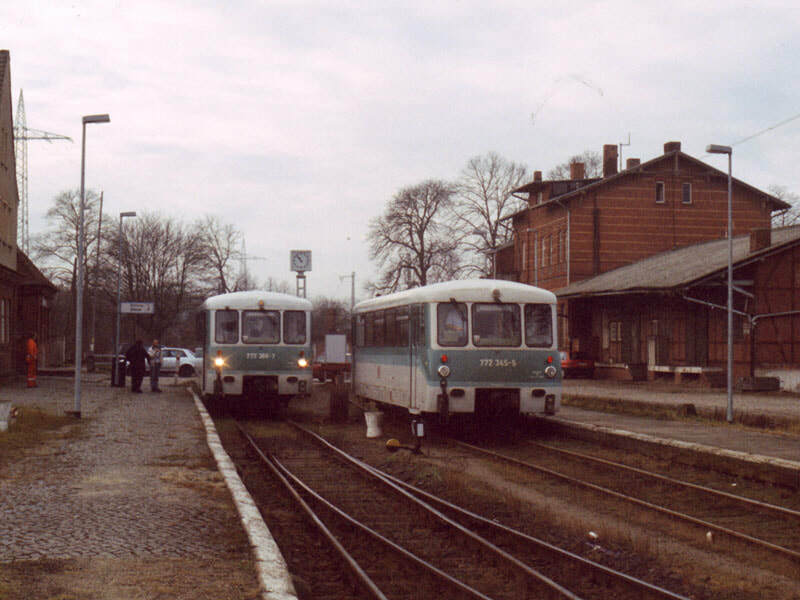 A well filled 2 car DMU was provided, with the return 1711 from Gifhorn almost as full. Civilised breakfast at 0700 after a wander in the Altstadt last night which included a conversation over weissbiers which covered such things as brewing in Ecuador and the Russo-Japanese war. Also found out that the Chancellor’s name is Schröder! [Chancellor Kohl had recently been replaced and I had been feeling guilty about travelling around in Germany without knowing who was now in charge. Having plucked up courage to ask this very well travelled local who was now the Chancellor, I was amused that not only did he not know, but hardly anyone in the pub did either. Eventually the barmaid provided the answer.] 0759 ICE to Kassel Wilhelmshöhe was the first train of the day. Max speed was 250kph, this being mostly new line. Kassel Wilhelmshöhe was as bleak and cold as ever – a great relief when 101 007 arrived on time with 0934 IR to Konstanz. A very pleasant ride ensued to Giessen (on time) through rolling countryside with some interesting looking towns, notably Marburg and notably not Giessen. 1115 RE to Haiger and Köln left from P15 on the southern arm of the ‘Y’ (see previous visit in 1997). Leaving Giessen it occurred to me that the junction at Haiger might be before the station. 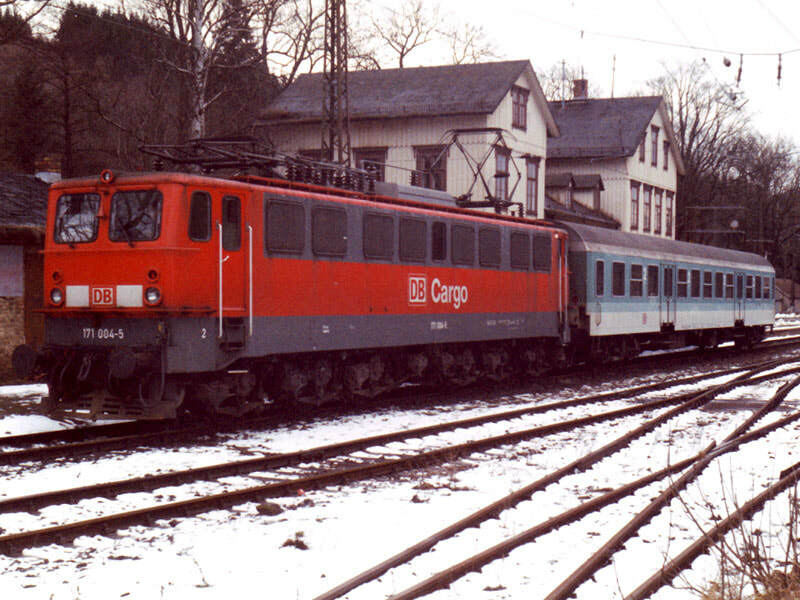 I therefore decided to change at Dillenburg, hoping that the service ran through on Mon-Fri as shown in the K-buch. Fortunately it does (I could probably have got back on the RE, but…). At Haiger the gamble paid off as the branch platforms are some way off the main alignment with the station buildings and a road in between. The branch is a very fine one, taking the short, but steep and winding route to Betsdorf. Barring a couple of school parties between intermediate stations there was not much traffic until near to Betsdorf. There werte also two students (I think) doing a traffic survey. Why does this happen to me? They weren’t interested in recreational travel by foreigners. A punctual arrival at Betsdorf, almost inevitable given a ten minute stop 18 minutes from Betsdorf, provided a suitable connection into a Siegen-Krefeld RE which took me uneventfully and no-new-trackfully to Köln hbf. Here I used up one of those lines you keep for something to do by using a Norddeich-bound IR to do the main line to Düsseldorf. Never mind, there’s still the S-Bahn for later. Finally found a stationer’s shop in Duisburg, after three days’ search, but it didn’t have a book like this one [squared paper, for simple folk]. I’ll have to go back to Verviers, or write less. Good old Duisburg produced another mayo-free ham roll (see previous visits) and the welcome information that my EuroDomino was OK for the S-Bahn. A short wander having produced no worthwhile pubs, I settled for König Pilsener in the station bar. Yuk, on both counts. Belgium was indeed the next stop. ADL were running a tour three weeks later over a variety of dock lines and I took the opportunity to get one or two 'oddments' finished off.